App ID : Facebook application ID. This ID will be provided by Facebook Developer’s page. Secret : Secret key provided by Facebook, so the application can be executed. Key : Twitter application ID. This ID will be provided by Twitter Developer’s page. Secret : Secret key provided by Twitter, so the application can be executed. Application name : Name of the application created on Google+. Client ID : Google+ application ID. This ID will be provides by Google Developer’s page. Secret : Secret key provided by Google+, so the application can be executed. PayPal URL : This URL can be to the PayPal SandBox or to the real PayPal API. The SandBox is used to perform tests with the application before applying the integration in a real environment. Id : PayPal ID to receive the sales money. Usually the registered email as business. Order number : Order Number to be stored in PayPal. Also used to treat the receipt of the IPN in order to identify and process the order as paid. 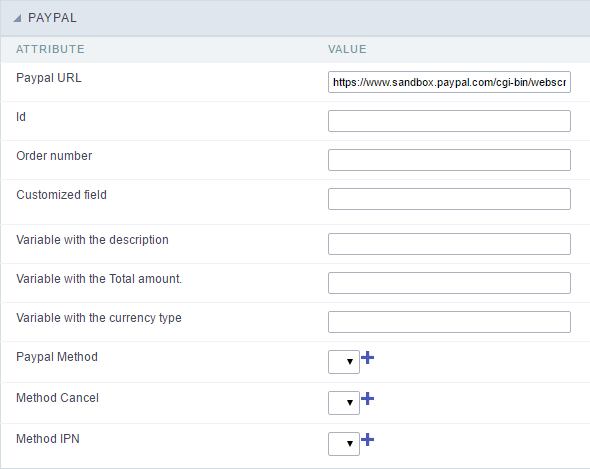 Customized field :Custom field to be stored in PayPal. Also used to treat the receipt of the IPN in order to identify and process the order as paid, if you want to do some additional checking. Variable with the description : Using this field you can place the Global variable that will contain the description to be sent to PayPal. Variable with the Total amount. : Method to be ran when PayPal service return the data requested. Variable with the currency type : Use to specify the payment currency. If the currency variable is not included, the currency defaults to USD.